Every other news site has covered the chaos that is Fallout 76 at launch. While I considered doing the same, especially after finding out about the fact that the beta had no uninstall option unless players purchased the game, that it has been review bombed on Metacritic, but the crowning glory of the steaming pile of crap was Bethesda's attempt at smoothing launch day over with this Tweet. You may recall the E3 articles where I covered most of the upcoming game announcements earlier this year. From those articles, it should be clear that I've never been much of a Bethesda fan in the first place. They have a history of buggy launches and it makes me wonder what types of systems they are running their own games on. So there's that. Anyways, since I know precious little about the franchise itself, and I'm not terribly interested in the game, I decided to avoid ranting about it because, in the end, I don't care about the game nor most anything that comes out of Bethesda. That said, I'll happily pass along other people's biting criticism, like that of Jim Sterling's Jimpressions video (below). Otherwise, if you want to know about the giant issues Fallout 76 has had since its launch on November 14th, then google is your friend peeps, but I suspect the gaming world is already very familiar with them! I practically rolled over and died when I came across the idea that Command & Conquer will be remastered. I know a lot of Chalgyr contributors are quite excited, though, I am not sure how I feel about it. Now, this is fairly big because fans of the genre are all over this piece of news, to the point that there is a long Reddit thread where people have asked a ton of questions and given their feedback. The giant thread discussion is underneath the official announcement by Mr. Jim Vessella, a producer for EA games. Because of my lack of history with the franchise, I do understand how much of a golden platter it sits on. I know that fans are more enthused about this announcement than the train wreck that was the C&C mobile game that was announced at E3 earlier in the year. However, I'll reserve judgment for when the game launches. I might even give the game a go but don't hold your breath. 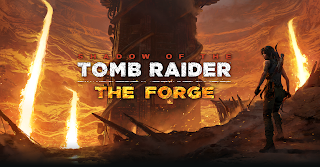 I think one of the most interesting announcements from this week was the new seven-part Shadow of the Tomb Raider DLC. It is known as The Forge and it launched November 15th, the standalone retails for $4.99 USD. You can get the Season Pass for $29.99 USD which will give players access to all of the DLC collection as it is released. The Forge adds new side narratives, more rewards, missions, outfits, achievements, and more! The official post can be found right here. Each DLC will have a challenge tomb, a weapon, an outfit, and a skill. What's more is, these tombs can be completed as a single player or a co-op experience. In my opinion, adding a co-op version is great because then players receive a higher level of difficulty that some argued was lacking in the base games, I don't disagree with this either. And given that the whole point of the Tomb Raider games is to find precious artifacts, I'm happy for the added content. However, the keyboard warriors out there have already written negative reviews on Steam because apparently there isn't enough content. Considering that triple A titles are regularly over $60 and are usually dealing with massive bugs, I don't see what the big deal is over a $5 DLC. Honestly, what the frick people? You say there isn't enough content for that low of a price point and I respond with quit whining, you entitled babies. What you want is worth more than $5 dollars. And nothing I've read in those negative reviews says anything substantial with respect to the DLC itself. Go be miserable elsewhere because there is a very big difference between a DLC and an expansion. A savvy Redditor discovered that Telltale Games are being removed from Steam's library. Thus far, Back to the Future and Tales of Monkey Island have become unavailable. At this point, we don't know which games will remain on Steam. Of course, the reason this is happening is because Telltale Games declared that they were shutting down. It put games like the final season of The Walking Dead in an incomplete state, which was highly anticipated by fans. Fortunately, it was picked up by Skybound Games who will complete its development. Many other bits of news released earlier in the week that I wanted to cover but I felt like Jaggy's Corner would be too long. So I wrapped up the ones that I thought were most pertinent. As always, I'd love to know your thoughts on any of the above-mentioned topics. Are you upset about Fallout 76? How do you feel about the C&C remaster? What are your thoughts about DLC versus expansions in video games? And finally, are TellTale Games being taken off completely or just off the purchase store and are you upset about it?